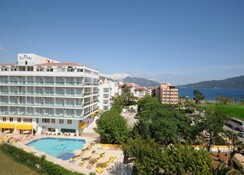 Sun Bay Hotel is situated in the heart of Marmaris, which is considered to be Turkey's largest yachting marina, offering spectacular views of the magic Aegean Sea and surrounding countryside. 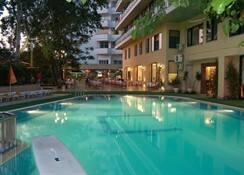 It is just 100m from the beach and 1.5 km from the city centre. 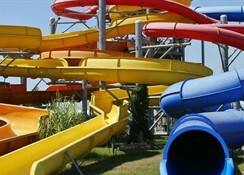 The hotel is designed to provide luxurious accommodation, with fully equipped rooms, a first class restaurant and a big variety of activities, that the guests are able to enjoy. The Buffet Restaurant serves both Turkish and International cuisines and has indoor & outdoor seating sections. 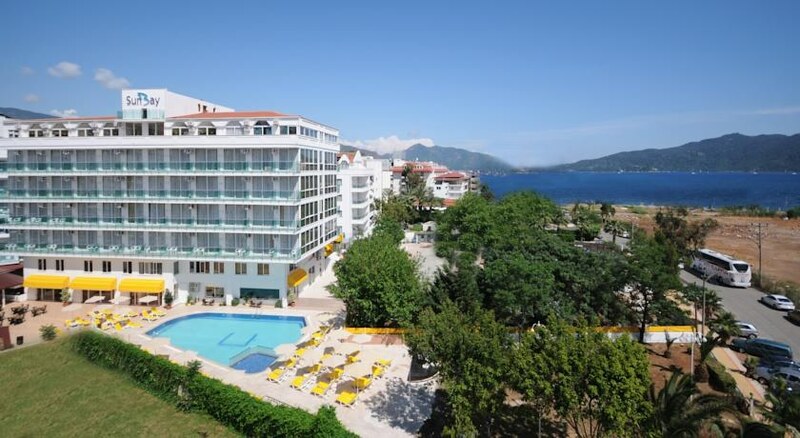 Amongst the amenities are considered the swimming pools (also for children), the fitness centre, the Turkish bath, hairdresser, billiards and many more. Whether you're relaxing with a cool drink by the pool under the sun or enjoying one of the many facilities on offer in the spa or joining in with the daily activities, the Sunbay Hotel has something to offer for everyone. Please Note: some facilities and services are payable extra. Imported drinks, local brandy, Turkish coffee, fresh juice and ice creams can be purchased.Rates are valid only for EU Passport holders.